Chris Gayle is known for his thunderous batting in T20 cricket. But, the West Indian veteran has made the news for some other reason this time around; for an effort as stunning as his huge sixes. Representing Vancouver Knights against West Indies ‘B’ in the final of Global League T20 in Canada on Sunday, Gayle was at the centre of attention after taking a stunning catch in the slip cordon. During the 14th over of the innings, a Fawad Ahmed leg-spinner turned so much that Kavem Hodge edged it. Gayle, deployed at widish slip, appeared to be missing the ball as the edge was quite fine. Somehow, though, he managed to get his left hand on to it. 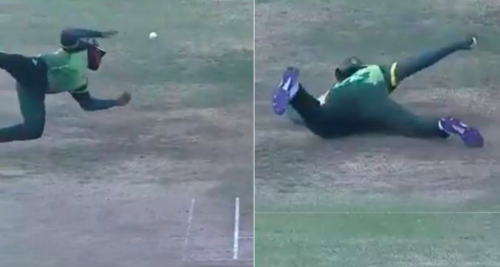 And even as it slipped out of his palm, he managed to complete the catch with his left hand while falling on his back (see the video below). West Indies ‘B’ would go on to set a 146-run target for Vancouver Knights, who – despite Gayle’s (2) failure with the bat – went on to win by 7 wickets and 15 balls to spare.